Now that Christmas is over everyone is gearing up for New Year's Eve parties. But I don't know about you, after all the holiday shopping, wrapping and baking I am just exhausted and not really interested in any heavy duty cooking for New Year's Eve. To me New Year's Eve is more about spending fun family time together and enjoying picky finger foods rather than a large meal like we just had on Christmas. I want easy and stress free recipes that do not require me to be in the kitchen when everyone else is relaxing. Easy recipes with few ingredients and minimal time is what it's all about to me. I can't think of another recipe easier than this one. It's still a classic spinach dip, but often it's made with mayonnaise. If you have allergies in your family as I do, most mayonnaise is made with soybean oil. That's a no no for us as my oldest has a soy allergy. I often have to replace mayonnaise in most recipes with other ingredients. I don't think you will miss the mayo taste in these at all since the combination of flavors from the two cheeses is where the flavor is at. The cream cheese gives you that fabulous texture you want when it comes to a dip. Even if you're not a lover of cottage cheese as I am not and really dislike the texture to eat it by itself, when combined in the blender you won't even notice it in there. When it comes to entertaining and enjoying the parties, preparing yourself with a healthier option is always the way to go so you will be less tempted to overindulge in unhealthier choices. Learning to live a sugar free lifestyle just takes some planning ahead and a little bit of creativity and you will never feel the least bit deprived at any party! Heat oil in a skillet and cook garlic until fragrant. Add spinach and salt and cook until spinach is wilted. Add cottage cheese, cream cheese and Parmesan cheese to a blender and blend until combined. Add cooled spinach to cheeses in blender and pulse about 10 times until desired texture and consistency. Makes about 2 cups. 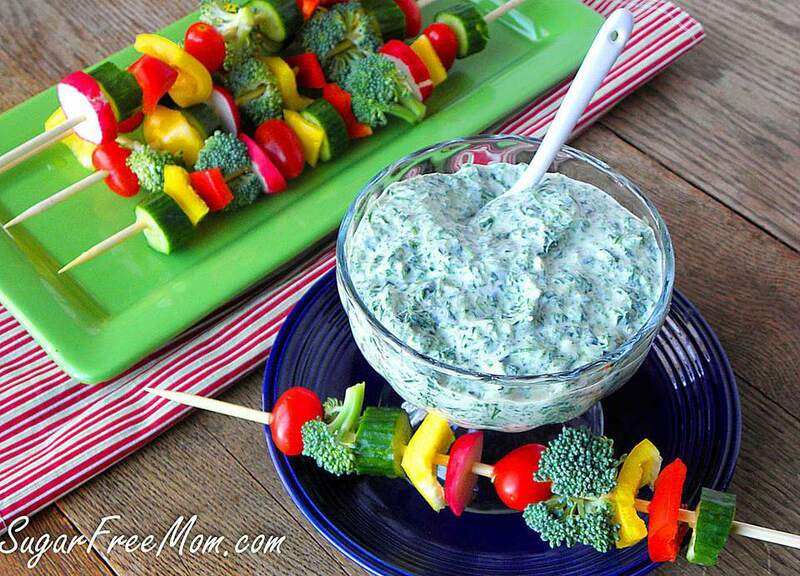 Enjoy with fresh chopped vegetable kabobs! What are 10 Healthy, Sugar-Free Appetizers and Snacks? What are 6 Low Carb Cucumber Recipes?